Though 40G and 100G have been widely applied in big data center, 10G is still popular with small homelab. Many 10G switches on the market are designed to used with SFP transceiver module and 10G SFP+ transceiver module, while TP-Link has two 10G switches—T1700X-16TS And T1700G-28TQ, which are respectively characterized by 10GBASE-T RJ45 ports or 10/100/1000Mbps RJ45 Ports. This article will make a comparison between them. 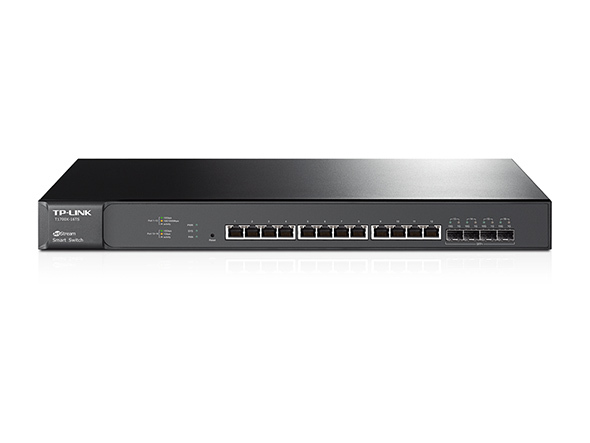 As members of TP-Link’s T1700 Series 10G smart switches, TP-Link T1700X-16TS And T1700G-28TQ are designed to provide increased scalability, higher bandwidth, and enhanced performance. In addition, with physical stacking improving performance and simplifying management, both of them are able to provide reliable, cost-effective and resilient networking solutions for SMBs. As you can see, here are two figures. Figure 1. shows TP-Link T1700X-16TS and Figure 2. shows TP-Link T1700G-28TQ. Both of them support rich L2 features, including 802.1Q VLAN, Port Isolation, Port Mirroring, STP/RSTP/MSTP, Link Aggregation Groups, and 802.3x Flow Control function. Both of them support supports L2+ feature static routing, which provides simple network segmentation by routing internal transmissions to make the flow of network traffic more efficient. Both of them support IP-MAC-Port Binding, Port Security, Storm control, and DHCP Snooping, which help to protect the network from broadcast storms, ARP attacks, and more. Both of them support 802.1X, which allows network clients to be authenticated through external Radius servers and the guest VLAN function allows non-802.1X clients to access specific network resources. Both of them utilize rich QoS policies to support voice, data, and video services on one network. Both of them support various user-friendly standard management features, such as intuitive web-based Graphical User Interface (GUI), industry-standard Command Line Interface (CLI), SNMP (v1/2/3), and RMON. Therefore, they are easy to use and manage. Both of them support Dual Image to provide improved reliability and network uptime. TP-Link T1700X-16TS is equipped with 12 x 10GBASE-T RJ45 ports and 4 x 10G SFP+ ports, providing 320 Gbps switching capacity. While TP-Link T1700G-28TQ is designed with 24 x 1GE ports and 4 x 10G SFP+ ports. As TP-Link T1700G-28TQ supports up to 6 units in a stack, it is able to provide 768 Gbps switching capacity. 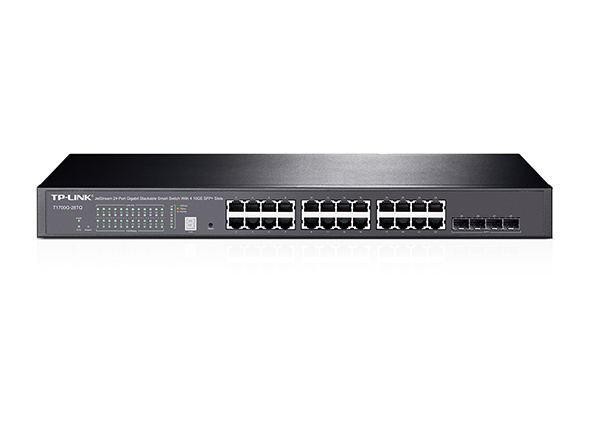 TP-Link T1700X-16TS utilizes 10GBASE-T technology which provides a cost-effective method for migrating from current network to 10G Ethernet by using existing Cat5e/Cat6 short connections (up to 55 meters) and Cat6a/Cat7 connections (up to 100 meters). While with true physical stacking technology, up to six T1700G-28TQ units can be stacked with a single IP address, which provides enhanced scalability, simple management, and increased redundancy for high-density deployment. TP-Link T1700X-16TS is a little larger than TP-Link T1700G-28TQ. The size of the former one is 440 x 220 x 44mm, while the latter one is 440 x 180 x 44mm. TP-Link T1700X-16TS is designed with two smart fans. While TP-Link T1700G-28TQ utilizes a fanless design, which reduces the amount of ambient noise. TP-Link T1700X-16TS can be used with 10GBASE-T copper SFP+ transceiver, 10G SFP+ transceiver and DAC cable. While TP-Link T1700G-28TQ can be used with Ethernet cable, 100/1000BASE-T SFP transceiver, 10G SFP+ transceiver and DAC cable. TP-Link T1700X-16TS is more expensive than TP-Link T1700G-28TQ. You can find TP-Link T1700X-16TS at $ 950 US dollars and TP-Link T1700G-28TQ at $ 308 US dollars on Amazon. From the above comparison, we can find that both TP-Link T1700X-16TS and TP-Link T1700G-28TQ have their own advantages. Before you make a decision, you’d better figure our what you most care about. If you want to use 10GBASE-T copper SFP+ transceiver, you can choose TP-Link T1700X-16TS. But if you want lower budget, then buy TP-Link T1700G-28TQ. FS.COM can provide you cost-effective 10GBASE-T copper SFP+ transceiver, Ethernet cable, compatible SFP module, 10G SFP+ transceiver and DAC cable. if you want to know more details, please visit our site.